Is your dog difficult to walk? Do they rush off to meet other dogs or people or investigate interesting smells and other distractions? Do they refuse to come back when called? This is a very common complaint which dog training expert Sue Kewley can help with. Sue teaches handling techniques to encourage harmonious and happy dog walking. In some cases, a double ended training lead can help, and Sue can teach you how to use it correctly. There are many reasons why dogs might bark or whine. This might happen when they have been left alone or when they are anxious in their environment. Sue will spend time interacting with and observing the dog, enabling her to get to the root cause and build a behaviour modification programme. Are inappropriate greetings a problem for your dog? Does it leap up or rush to the door uncontrollably? If so, Sue can help. Sue is a member of the APDT (Association of Pet Dog Trainers)and has completed a COAPE (Centre of Applied Pet Ethology)diploma, enabling her to diagnose the root cause of your dog’s behaviour and create a bespoke behaviour modification programme. The chase drive is very high in some dog breeds, but it can be inappropriate and dangerous. Dogs that chase traffic are in grave danger of being run over, and the dog’s behaviour can also endanger the driver of the vehicle and other road users. Sue can help with training that will help the dog override it’s natural instincts. As mentioned above, the chase drive is entirely natural and very strong in some breeds. Dogs that chase livestock may be liable to cause criminal damage, not to mention the distress to other animals. 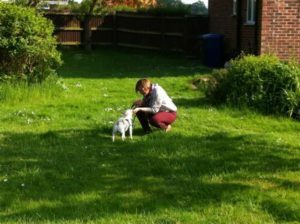 With 30 years dog training experience, in Norfolk and Suffolk, Sue can help train dogs with these tendencies to redirect their natural urge to chase. Sue will also be able to suggest coping stategies for owners when they are presented with these difficult situations. Is your dog disobedient? Does it sit on your sofa, or bed, or does it jump up on your lap? Does the dog’s bad behaviour make you feel that you cannot invite visitors to your house? There can be many causes for this and Sue will spend time observing the dog in it’s home environment and this will enable her to diagnose the root cause of the dogs disobedience, and create a behaviour modification programme to recreate a happy home. Nobody likes an anti-social dog, and aggressive or reactive animals are Sue’s speciality. Sue will take your dog through a series of one on one sessions in the home and out and about. Gradually the dog will be reintegrated into normal dog walking and other social activities. Is your dog afraid of fireworks or guns? Does you dog hate to travel in cars? Sometimes these anxieties can be so strong that the animal is too afraid to go out of the house. This can be a particular problem for rescue dogs and sometimes these general anxieties can be the cause of other problems (such as straining at the leash when dog walking). Sue Kewley will draw on her considerable training and experience to interpret the underlying cause of the problem, and then suggest a programme of training that will deal with the presenting problem. Some dogs are more prone to obsessive behaviour than others (Collies in particular). These obsessive behaviours can manifest themselves in many ways including obsessive shadow chasing, chasing lights, or obsessive licking. They can be difficult to challenge, but Sue can suggest many approaches, including enrichment of the dogs environment etc. Sue will work closely with the owner and the dog to generate a management plan based on the cause of the dogs behaviour. This can be a problem for cats in particular, and the consequences can be very unpleasant indeed! Help is at hand however, as Sue can visit your house and provide a one on one consultation, leading to a bespoke behaviour modification programme that will help change your cats habits. You can read behavioural case studies here or view a gallery of dog and puppy behaviour training here.